Removing the footer from digests listing all the user's digest options. The link to the UCP digests page where they can change settings remain. Will we be able to enable / disable it in the admin? It is good for debugging. That is not planned. However, Edit Subscribers allows you to view any details about a user's digest subscription. And the manual mailer gives you a way to recreate it for a date and time, send it to your, or write it to the file system for download. The manual mailer no longer saves to /cache/phpbbservices/digests but to /store/phpbbservices/digests instead. If you want to view the files saved to your web space, use FTP to download these files and look at them in a browser in local mode. Digests no longer have footers showing the user's digest settings. However, the link the the User Control Panel remains and they can use that to quickly change their settings. HTML digests are now called styled digests (less geeky). HTML digests have markup to aid in the display on mobile devices. Edit subscribers now filters out inactive users. It's possible a user will subscribe to digests upon registration but the account will not be activated. Edit subscribers has enhanced HTML. id attributes added to <th> tags. Corresponding <td> tags link with the appropriate headers attribute. Check boxes and select boxes have title attributes. Manual mailer indicates that when specifying a date and time to create digests, it is based on server time. The term "folder" is used instead of "directory". You can download the archive from the first post of this topic. You can download it from GitHub here. If you download it from GitHub, make sure you place it correctly in the ext/phpbbservices/digests folder. Summary of changes from the 3.2.8 release can be seen here. This is a possible change for a future version. It's not something that phpBB has built in. How does the forum get sorted? I have that option at the bottom of the board. 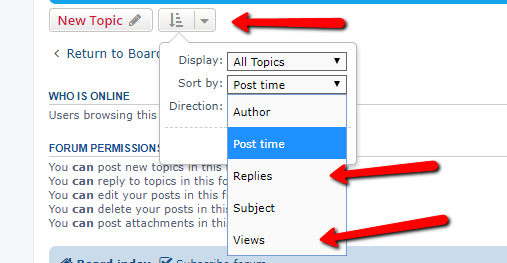 There is a default sort order for topics in a forum (last post time, most recent first), but you can change this default in the user control panel so it applies to all forums you visit. Digests won't change the sort order on a per forum basis. In fact, phpBB won't store this either. I don't know if you can use it in some way with your extension to have popular posts in the digest. Yes, I know. But if you leave the forum to the index then go back into it, the settings revert back to your default. Since phpBB does not store per forum sorting behavior, digests doesn't either. You can change your default sorting in the UCP and it should apply to all forums. By default digests will use these settings, but you can override them in the UCP digest interface. So there is no easy way to do it in digests? If you change your display settings in the UCP > Board preferences > Edit display settings and select UCP > Digests > Additional criteria > Post sort order > Use my board display preferences then digests will use your board preference settings. Otherwise, no. I mean can you send digests by how many replies or views a topic has had? Or any other way to send popular topics in digests? There is no way to filter for "popular" topics. While phpBB tracks views and posts in a topic, it doesn't track how many were made over the digest time period. For some unknown reason there are no digests created. However, the mail-functionality of the board works just fine, using a local postfix in smarthost configuration. Sending mails from the phpbb3 3.2.3 works and has been working for a year. Made a backup and did a chmod -R 777 (not without shuddering) on the whole phpbb3-html-dir to see if this is a fileaccess-problem.